Are you one of those parents who really want their kid to be a musical genius? Do you follow America’s Got Talent or X Factor and hope that your little one will grow up to be a star? Or perhaps, you notice that your little one loves music so much that you are almost sure that he or she is going to pursue a career in music? Well help your little Ed Sheeran, Adele or Taylor Swift get a head start with these musical toys for young kids. Created for children but modeled on actual instruments that are used in a band, maybe they will show real interest in a particular instrument! Famous guitar-playing celebrities include Ed Sheeran, Jimi Hendrix, and Elvis Presley. The guitar is one of the most versatile musical instruments in a band. With commitment, most music lovers without any formal music education can learn to play this instrument competently. It’s also one of the best easiest instruments to learn “perfect pitch,” which is the ability to recognize a tone without prior reference. Such a great talent to pick up! The First Act DY285 Disney Dory Mini Guitar Ukulele is a really good beginning ukulele/guitar for young kids. It has real tuning gears and nylon strings. More importantly, it can take the rough handling of a young toddler. It comes in other patterns including the Avengers, Disney Princess, and Mickey Mouse. 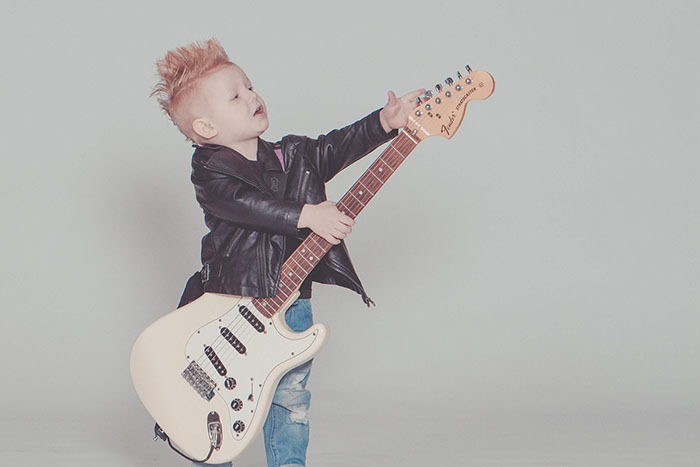 Once your child is able to handle toys with more care, you can graduate him or her to an actual guitar. Or if your child is old and mature enough to handle the real thing, get him or her the Hohner HAG250P 1/2 Sized Classical Guitar which is half the size of an adult guitar but plays like a real instrument. Top musical celebrities like Taylor Swift, Lady Gaga, and Miley Cyrus are actually also comfortable on keys. As a standalone instrument, the piano is undoubtedly one of the best instruments to pick up as it can produce beautiful music without the need for other instruments. If you would like to build a love for the piano with your child, we recommend the Melissa & Doug Learn-To-Play Piano because it looks and sounds so much like the real thing! Unlike electronic musical sounds, this piano actually only plays the exact note that your child presses. It has two whole octaves of notes and also comes with a songbook. Is your favorite Beatle member Ringo Starr? If yes, you are probably a fan of the drums. Most toddlers love banging stuff to make loud noises. You may already have discovered that they will use anything to create their ‘orchestra’…like grabbing a spoon to attack your kitchen table legs, banging cooking pots together or using a toy to hit your face. Drum toys, however, tend to be a dangerous mix. They can be your child’s favorite toy but also, your least favorite toy. In fact, the more your child loves banging the drum, the more likely you are going to hate it too. You could try to enjoy this phase by getting them something that plays actual melodies and not just construction-like banging noises like the VTech KidiBeats Kids Drum Set. This drum set not only allows free play but can also teach letters, numbers and keeping in tune to beats. If they are a little older and want something that sounds like the real thing, you could get them the Junior Drum Set by Mendini but word of warning- you will want to soundproof the room! The drum is also a percussion instrument but here, we are talking about someone who can play a whole range of percussion instruments. Percussion instruments are a great way to allow your child to learn and love rhythm and beats! A percussionist plays an important part in adding rhythm to music and Innocheer Kids Musical Instruments is a great way to get your child started! It has 17 different pieces of instruments that all help a child to keep a beat. We love that this set comes with shaker eggs, maracas, finger castanets, bell stick, tambourine and even a kazoo! To keep things neat and tidy, the instruments fit nicely into a see-through backpack so that your toddler can carry them easily to any music class. If you prefer to keep things simple, you can just invest in a good, quality xylophone with clear tones. Some xylophones are poor in design and quality which results in uneven tones but this set is built to last. It has two solid wooden, easy-to-hold mallets and also comes with a bonus eagle whistle (huh?). But we are not going to complain about free stuff! The finishes are also BPA, phthalate and lead-free. For non-musical parents, an electric organ is NOT the same thing as a piano. Yes, they have similar black and white keys but they sound and feel very different. An electric organ’s keys are a lot softer than a piano’s but you require the same level of skills PLUS the ability to mix and match sounds, often mid-way through a song! Many electric organs have different features and it takes time to get used to the buttons, the sounds and how the electric organ operates. So if your child is serious about learning this instrument, it makes sense to invest in one that will last for a long time. The Sanmersen 61 Key Multi-function Portable Electronic Organ has a list of variable instrument sounds, beats, timbres and functions and will keep your child very engaged! A violin is one of the harder instruments to pick up as an adult. Like the piano, it requires a lot of skill (imagine trying to produce an entire range of notes from only 4 strings!) If you want your kid to learn the violin, start them young! It will be so much easier than waiting till they are older. Mendini produces some good solid wood violins in different colors and sizes, to match the size, age, and interests of your child. A word of advice- your child will probably need professional classes to master this instrument! Last but not least, consider getting your child a great microphone. Vocals are your child’s natural instrument and as we all know, most musical celebrities can not only sing but eventually do establish themselves in their own right as a singer/songwriter. Think of Beyoncé, Justin Timberlake and Sting. To help them get excited about growing their vocal strength and range, invest in some of their favorite music and resource them with a good microphone. The Anzor Microphone works well with an iPhone, iPad or home karaoke machine. Better yet, get two microphones and join in the fun! If you lead by example, your child is more likely going to develop a natural interest for music. So start up your Spotify app and start singing!